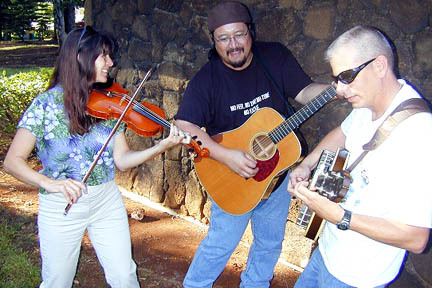 Lisa Gomes, left, Gordon Freitas and Steve Hady are just "Local Folk" at Sunday's Twang Jam at Kapono's. It's time to give local musicians such as Gordon Freitas and Lisa Gomes credit for helping keep the folk flame a-flicker here in the islands. And a tip of the hat should also go to Caroline Wright of Bluegrass Hawaii for giving those two, and others like them, a chance to showcase their stuff at this weekend's first Twang Jam. Also: Bluegrass harmony singing workshop and beginners' jam session. Upcoming monthly events scheduled for Sept.. 19, Oct. 24 and Nov. 28. What will be a monthly event through November at Kapono's, Twang Jam will showcase local traditional (and traditional-minded) bands, related workshops and a jam session, the common meeting point for all musicians of every skill level to play together. Freitas, who with Todd Adamski, form one version of his Local Folk band at his regular gig at Cheeseburger in Paradise, will also include other fine "local folk" in acoustic performances at Twang Jam, including Eric Peterson, Chris Cerna and the fiddler Gomes. "The main purpose of Twang Jam is to incite other people to jam together after our performances, which is going to be cool," he said. An Army brat who's traveled the mainland with his family, Freitas has family here as well, and has lived in Hawaii since 1985. He has distinguished himself by writing and performing folk songs with local themes. Performers hope Twang Jam will appeal to an audience curious to find out more about folk and bluegrass music. "For our group," Freitas said, "we'll be dealing with songs that a wider audience can get a grasp on -- not the real, down-home bluegrass, but songs with a more folk-driven side. ... It'll be a fusion of a whole lot of things. "Some of our friends I would term as purists, those intent on preserving the tradition, like the Squirrel Hunters (who'll be playing at a future Twang Jam) and the Wild Orchids. 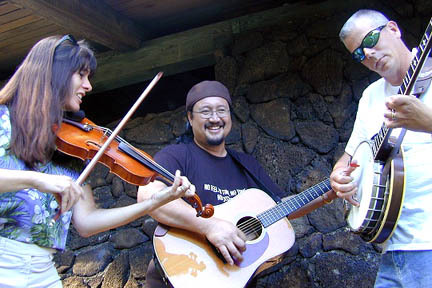 I commend them for that, and I'm pretty much a fan of those guys, who are part of Bluegrass Hawaii. "Caroline's organization is a perfect example of grassroots promotion, of keeping music alive through events like these, and getting community support without help of marketing. She's keeping the vision alive, and helping find a place for people like us to converge." Gordon Freitas, center, fiddler Lisa Gomes and banjoist Steve Hady will present their fusion blend of folk and bluegrass. ONE THING Gomes has learned here is the ability to play with practically anybody. Formerly with the Irish Hearts, a regular at O'Toole's Pub for 6 years, she stopped playing 2 years ago due to some of the band members' moving to the mainland. She's also played with the local Cajun band Bon Ton Roule. "With bluegrass, and looking at other traditional music, there's always some overlap -- bluegrass was originally folk music from Ireland and Scotland that became Americanized. There's a lot of cross-influences, so it's not a great stretch for someone like me to play with Gordon. ... Each of the traditions influence and support each other." Gomes also has high praise for Wright's work. "She's brought in all these great traditional folk musicians from the mainland to do concerts here, and here we've been stumbling around doing this on our own for 20 years," Gomes said. "The jam sessions have since become a regular thing, and it's made for a better networking system, thanks to Caroline." Gomes, who is a clinical psychologist, says playing "music means so much to me. It's part of my life, it keeps me going, it's my soul energy." "This is a very friendly genre of music," she said. "If you want to start to learn to play music, this is such an excellent opportunity. Everyone is very encouraging, to do the best that they can."